Do you remember that movie Groundhog Day? The one where Bill Murray repeats the same day over and over again? 1) Eat lots of cookies, cakes, pastries. 2) Wash that down with eggnog. 3) Repeat until there isn't so much as a sprinkle left. 4) Make New Year's Resolution to exercise and lose all of the new-found weight. Every year it was the same thing. And every year I had the same New Year's Resolution. Empowered by this very small victory, I've decided that every New Year's Resolution from now on will include a religious component. Every year I want to grow closer to God. To do something more for Him in the upcoming year than I did in the past one. I guess you can say that I never want to have a spiritual "Groundhog Year" again. I'd love your help as I look to write mine for 2010. Any ideas? Are you making any Spiritual Resolutions for the New Year? I'm on board also with the religious component, nothing else really works without it anyway, or matters. One of mine this year is to be more proficient in apologetics. I know what I believe and why but translating that to others has always been more of a challenge, difficult even. I may even follow your lead and get an audio Bible (might be hard finding the Douay Rheims version though), I can't quote scripture at all without minutes of searching every time. I've also decided to give more to the church. I spend A LOT of money on books and this year, I'm limiting my amazon purchases to either apologetics or books dealing with Our Lady. The money I would have spent on other books is going to the collection basket. Mine would include the ones I failed in last year: More works of penance, and mortification, which I apply to the Holy Souls in Purgatory. It helps me if I think I am doing something for others, especially those who can no longer help themselves. Any new year resolutions I have made (which aren't many) have been forgotten in days or weeks. I'm not sure I've even considered a spiritual one, but I like that idea. I'll think about it. I started making more spiritual resolutions a few years ago, I find this to work much better than the groundhog year routine~great analogy by the way. This year I am aiming to work along the same lines as Shirley with the penance and mortification. I've gotten a little, maybe a lot wishy washy with it~doing only required fasting etc. Thanks for your comments on my blog earlier. Michael, I like how you call it a spiritual groundhog year. I can so relate to that, especially in the confessional. It seems I list the same old sins over and over again, but never follow through on any real change to avoid them in the future. Time to get serious! I never follow through on any of my New Years resolutions either but I do like yours Michael. I think it's a great idea. I think it's also the one that will give us the most happiness. I have really enjoyed blogging with you. I know I have said it before but you are truly an inspiration. I hope you and your family are blessed with an incredible New Year. Happy 2010! What an awesome post Michael! Your insight is amazing as well as your constant focus on soul building! I feel real positive about the upcoming year and look forward to serving Him this year in anyway I can. In fact, a lady once told me that her daily prayer was "Lord, make me a servant". It was maybe 6 years ago that I heard this, but this year, it is my prayer too! God Bless you and your wonderful blog...I just love it! Groundhog Day was a fun movie! 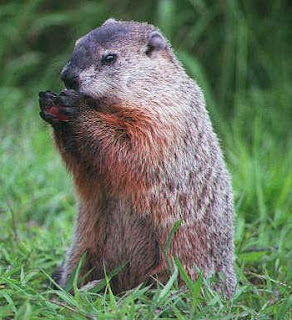 I hope you will have a straightforward year in 2010, not a groundhog day year. In any event, Happy New Year! Beautiful, insightful post as usual dear friend. Ha! I love your description of past self-defeating New Year's resolutions & subsequent failures; they could be mine! I've always been big on audiobooks. Turn off the radio noise and tune into prayer/spiritual treasures. As for this year, well for me I'm going to keep on with where He's leading: daily Mass as often as possible, daily mental prayer, bi-monthly Confession (weekly when I can get the time from work) and trust Him in everything. Mostly, the trust. God bless you Michael and let's keep on encouraging one another to Reach for Paradise! Love the title of your blog! Shirley/Karinan/Booklady: I'm with all of you on adding Penance. Maybe this will the be year I follow through on it! Pennyyak/Anne/Carol/Daily Grace/Elizabeth: Thank you for your kind words! And thanks to all of you for the ideas and motivation!